The study was conducted in Benue State, Nigeria to assess prospects of rural youths participation in family farming. Data were collected from a sample of eighty (80) respondents using questionnaire/interview schedule. Frequency, percentage, mean score, standard deviation and factor analysis were used for analyzing data. Majority (75%) of the respondents were males, not married (63.70%), about 99% had formal education, having a mean age of 24 years. Major activities engaged by rural youths in family farming were clearing of farm lands (M = 2.62), harvesting of crops (M = 2.61), irrigating of farm lands (M = 2.39), staking of crops (M = 2.35), sorting/grading of farm produce (M = 2.35), gathering of fruits (M = 2.34) and applying fertilizer to crops (M = 2.33). Results also indicate prospects of rural youths participation in family farming which include proper farm record keeping (M = 2.66), increase in household food security (M = 2.60), increase in farm labour (M = 2.58), provision of market information for sales of farm produce (M = 2.58), increase in household income (M = 2.55), proper preservation of seeds and seedling/planting materials (M = 2.54), increase on the use of modern farming techniques (M = 2.53), increase in farm yields (M = 2.50, among others. The study thus recommends that rural youths should be supported to remain in family farming through adequate provision of labour-saving technologies and modern farm implements to ease operations and ensure optimum productivity. It also highlights that efforts of service providers are needed in providing youths in rural areas with necessary infrastructure such as electricity in order to discourage them from migrating to urban areas. 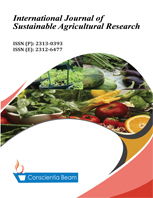 This study contributes in the existing literature to indicate that rural youths in family farming were mostly engaged in clearing of farm lands, harvesting of crops, irrigating of farm lands, staking of crops, sorting/grading of farm produce, among others. They should be provided with necessary farm inputs for optimum productivity. The objective of our study was to evaluate the promoted effects of three arbuscular mycorrhizal fungi (AMF) on maize growth and yield on ferruginous soil in center of Benin. The maize variety used was EVDT 97 STR C1. The maize seeds were inoculated with each of three arbuscular mycorrhizal fungi (Glomus intraradices, Funneliformis mosseae and Rhizophagus cubens) combined with or not to mineral fertilizer dose recommended (50% of NPK). The experimental device was a completely randomized random block of nine treatments with four repetitions. The data collected were related to growth (height, diameter and leaf area), yield (biomass and grain yield), mycorrhization (frequency, intensity and number of spores) and NPK content. The maximum height, best seeds yield and larger leaf surface are obtained with maize plants treated with R. intraradices combined with 50% of NPK respectively surpassing of 17.44%, 38.14%, 45.99% the values obtained with the controls plants. 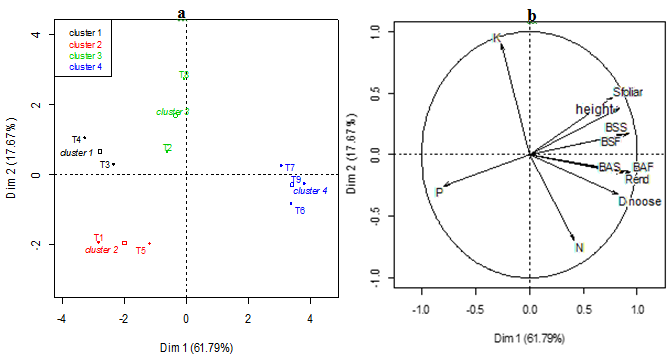 G. cubens combined with 50% of NPK was induced an increase of diameter (6.50%), dry aerial biomass (32.86%) and dry ground biomass (94.73%) compared to the control. G. cubens only has led to the best frequency (41.25%), intensity of mycorrhization (6.07%) and a high number of spore (1.81 spores/g soil). These results show the potential of these arbuscular mycorrhizal fungi to improve the maize productivity on ferruginous soil in center of Benin. The paper's primary contribution is finding that mycorrhizal inoculation increase maize productivity by reducing the use of mineral fertilizer.